If you’ve ever gone looking for books, articles, or–well anything! written about correctional medicine, you will quickly notice that there really isn’t very much out there. The specialty of correctional medicine is in its infancy. You can count the number of published books about the subject on less than two hands. So a day in which a new book about correctional medicine is published is always a good day. And if by chance that book also happens to be well written and truly useful, well, that’s a true bonus and time for celebration. Lorry Schoenly has written such a book that I recommend for all of us who practice in jails and prisons. This is a book that has universal applicability, whether you are a nurse, a practitioner, a mental health provider or an administrator. The name of the book is Correctional Health Care Patient Safety Handbook. You should read this book! If you don’t already know Lorry Schoenly personally, you probably have heard of her by reputation. She is a frequent (and good!) speaker at NCCHC. She writes a wonderful blog about issues in correctional nursing at CorrectionalNurse.net. She is the co-editor of THE definitive book on correctional nursing: Essentials of Correctional Nursing. And now she has published an important new book for all levels of correctional medicine: Correctional Health Care Patient Safety Handbook. Hire an essay writer online and forget about problems with essays and other writing assignments. You don’t have to write them. We will do it for you. 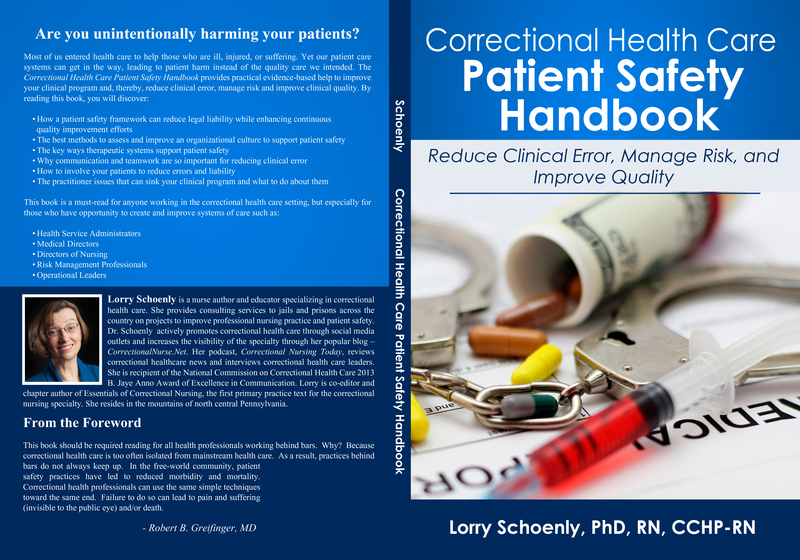 The stated purpose of the Patient Safety Handbook is to “Reduce Clinical Error, Manage Risk, and Improve Quality.” These are especially important goals for correctional medicine since we practice in a field with both high volume of patients and a high risk of litigation. We all have had the experience of having a patient “fall through the cracks” and become lost in our system. Lorry’s book provides an outline to review our internal safety net policies and procedures to make sure that we don’t lose contact with our patients, and that we provide the best quality of care. The Patient Safety Handbook is a short book of 144 pages. There are five chapters, each dealing with a different aspect of the ideal correctional health care system. Each of the chapters is divided into four or so sections. The layout of the book makes it user friendly for browsing and reviewing individual topics that you might be interested in. The first chapter presents an interesting twist on traditional thinking about health care systems analysis. Historically, health care systems, whether hospitals or private practice, have had two ways of thinking about systems issues. The first is Risk Management, which is focused on reducing legal liability. The central figure in Risk Management is the institution and in reducing risk to the institution. The second is Quality Assurance (aka Continuous Quality Improvement), which is focused on clinical care. The central figure here is the caregiver. I myself have extensive experience with both types of programs throughout my career. Lorry proposes that instead of emphasizing the institution or the caregiver, we should instead recognize that the patient is the most important person in the grand scheme of things. What a concept! Instead of concentrating on the needs of the institution or the caregiver, we should focus on the needs and experience of the patient. If we do this well, we will simultaneously have good risk management and quality of care. The first chapter goes on to analyze the root causes of significant medical errors, from the factors that lead to them, to the consequences including grievances and legal claims. This chapter alone is worth the price of the book. I myself have changed the way I fundamentally think about medical errors as a result of reading this chapter (I have re-read it five times). This chapter alone is worth the price of the book. Chapter three is entitled “Systems for Therapeutic Action” and it discusses these “Best Practices” in some detail. The overall goal is to create a cohesive healthcare team in which each person understands not just their own job but how their job interacts with all of the others. In this way, team members “have each other’s backs,” and help and support other team members. This chapter also discusses the important topic of communications, both verbal and written, from proper “hand-offs” to clinic notes, to check lists even down to effective white board communications. The subject of chapter four is The Patient. This chapter discusses ways of involving the patient in the health care process, not just as an object, but as an active team member in their own healthcare. This, of course, involves patient access to health care, dignity and respect issues and education. The chapter has sections an barriers to patient involvement as well as (again) “Best Practices” to increase patient involvement. The last chapter focuses on us, the health care workers. In order for us to be effective, we must be licensed and competent. Health care workers new to corrections need to be fully oriented to this new specialty. This chapter also address issues of burn-out, impairment, and even an issue near and dear to my own heart, cognitive dissonance. I would recommend this book to anybody working in correctional healthcare, especially administrators. I challenge you to read this short book and come away with several ideas on how to improve your own performance as well as that of the team! You can access the Correctional Health Care Patient Safety Handbook HERE. Lorry is to be congratulated for writing such an outstanding book. Cheers, Lorry! I look forward to your next book! 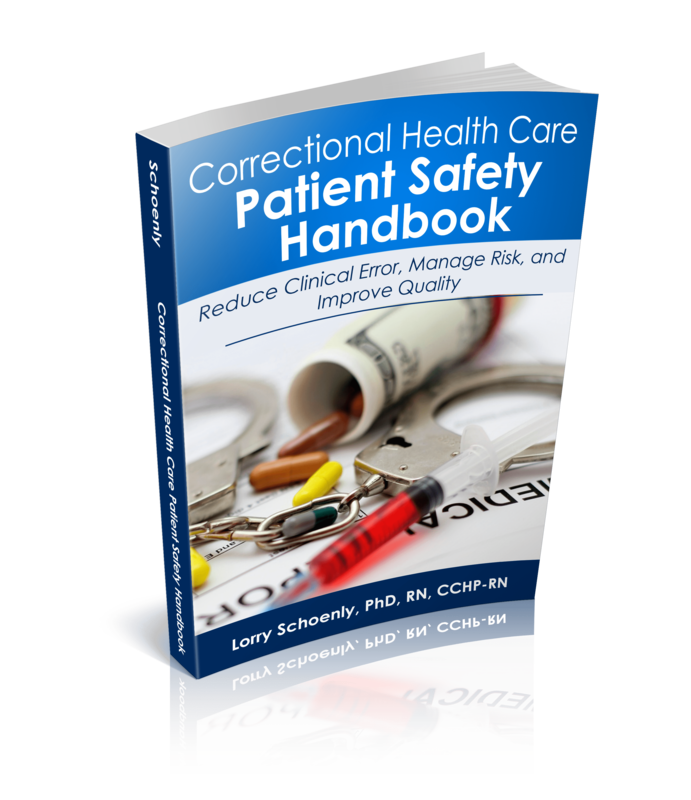 Have you read the Correctional Health Care Patient Safety Handbook? Please comment! This entry was posted in Book Review, Medical Practice, Procedures and tagged correctional medicine, evidence based medicine, inmates, jail medicine, jails, pharmacy practice on April 10, 2015 by Jeffrey Keller MD. I really enjoy her books and use them in my practice. I have also shared them with my coworkers.